The meeting place was near the pool entrance. Shioriko latched her milky white arm around Koremitsu’s, probably due to the excitement at the prospect of going to the pool. This aspect however clearly highlighted her innocence and cuteness as a child. Honoka was the first to arrive, and was waiting for Koremitsu’s group. This was the second time he saw her dressed in casual wear, but on this day, she was dressed in a sleeveless summer knit and a slim pair of pants. The ridiculously large earrings and pendant matched the brilliant summer, and her great figure, coupled with the long, refined legs, made her resemble a fashion model. After seeing Shioriko latch onto Koremitsu’s arm by the side, Honoka narrowed her eyes, her lips sharp. A forced smile appeared on Honoka’s lips. Shioriko in turn replied with a radiant smile. 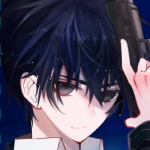 It was practically a recreation of the events two days ago, though both of them looked courteous on the surface, there was a frosty atmosphere beneath, and Koremitsu inadvertently let out cold sweat as he watched on. And the bespectacled class representative with braids ran over to them, huffing and puffing like a goldfish. She stopped abruptly in front of Koremitsu and the rest, adjusted the glasses on her nose bridge, and readjusted her breathing. Honoka responded to Koremitsu’s skepticism. Shioriko tugged at Koremitsu’s arm, ready to pull him. At this moment, Honoka stood in front of them immediately. And then, she pulled Shioriko’s milky white arm over. Koremitsu was dumbfounded as he watched Shioriko get dragged away by Honoka, one step at a time. And so, Honoka dragged Shioriko through the gate. Michiru followed Honoka quietly from behind. On a closer look, she was dressed in school uniform even though it was the summer. Koremitsu whispered, and in turn, Hikaru’s face was dazzling. And he was yelling excitedly like a child. And so, Hikaru changed clothes about 7 times in the men’s changing room. Koremitsu turned his back on his friend as he silently changed his clothes. Even at the poolside, Hikaru’s was grinning from ear to ear..
Hikaru stared at the pool that was filled with customers, and looked over at the customers waiting to ride the slide, looking impressed. After much contemplation, he picked a refreshing pair of pool pants that glittered as brightly as his marble white skin. Koremitsu could not help but think about this. No matter how silky white his skin was, how slender and refined his limbs, his skeletal structure betrayed the fact that he was male, and not female. Hikaru himself was not typically particular about his body frame, but after seeing Koremitsu’s chest, he pouted, moved towards Koremitsu, and compared their arms. While he interrupted this completely foolish worry, Honoka and the others, having changed their clothes, finally appeared. Hikaru in turn exclaimed in amazement. Shioriko was dressed in a white separate swimsuit with ribbon and flower decorations, coupled with flower-like frills surrounding the waist. Honoka was dressed in a purple bikini with matching black trims that emphasized a mature vibe. Hikaru narrowed his eyes to a seem, heaping effervescent praises of the the pair’s swimsuits. Koremitsu felt that something was stuck in his throat. Honoka pouted her lips shyly, and Shioriko was bashfully staring at Koremitsu. There brewed a tense atmosphere between Honoka and Shioriko. He uttered out such words awkwardly. Both Honoka and Shioriko turned their heads aside. Michiru pointed at herself, shocked. Honoka and Shioriko stared right at the swimsuit Michiru was wearing. The most ordinary type of swimsuit worn during school swimming classes, to boot. For Koremitsu, he could not simply praise Honoka and Shioriko wholeheartedly while ignoring the class representative with braided hair. Though both of them realized this fact, they could not help but bemoan. Why would both of them look so downhearted, giving Koremitsu conflicted looks of condescension and disappointment? Hikaru nodded as if he was a neutral party amidst all of these. After saying such words, he started stretching his limbs, warming himself up. However, he should not have raised his eyebrows at this moment, for the surrounding people gradually scattered, mistaking him for a delinquent. Michiru tried her best to console Koremitsu, but the latter felt a prickly feeling in his heart. Having recovered from her shock over the school swimsuit, Shioriko reached her little hand for Koremitsu’s, and was about to walk off. Michiru grabbed Shioriko by the elbow. Honoka suddenly looked a lot cheerier as she pat her hands upon Koremitsu’s back, pushing him to the adult pool. Shioriko shook Michiru’s arm off. Honoka puffed her chest that was covered by the bikini, bragging haughtily. Shioriko hugged Koremitsu’s waist, and lifted her head. It was normal for Shioriko to do this. However, it was a different feeling having direct skin contact. He felt ticklish on the belly, and nearly jumped due to the itchiness. Honoka’s eyes broke into a glare. Honoka and the rest were shocked. Shioriko, who was looking glum before this, broke into a radiant smile immediately. And so, both Honoka and Michiru lowered their heads. His heart raced as he suddenly felt tense. Right, he was always feared by others at school, with nobody he could call a friend. He never entered the water other than the school pool. Regarding this pool, his excitement at going to the pool with others was the same as Hikaru’s. With an aberrant anticipation, they arrived at the flowing pool. Koremitsu sat beside the pool, placed his legs in the water, and was shocked when he felt the moving currents flowing to the side. He entered the water, and it reached his waist. There was a levitating feeling at his waist, and he floated up comfortably. Koremitsu quickly responded to Hikaru’s question, and the two men continued to enjoy the flowing pool. Michiru closed her eyes as she lowered her head and apologized, her glasses covered with water droplets. With the weight suddenly added upon his back, Koremitsu’s head dipped into the water. Shioriko climbed upon Koremitsu’s back, giggling away. Her wet swimsuit was sticking tightly onto his back. Hikaru poked his head from the water surface, looking blissful. And so, Koremitsu continued to carry Shioriko as he trudged forward. Shioriko in turn was buzzing away. And Hikaru, swimming (?) beside them, looked envious. Hikaru floated from the water and leaned on Koremitsu’s back, looking like he was embracing Shioriko from behind. But even so, he ended up passing through Koremitsu, only barely managing to maintain contact with the latter. Perhaps he liked this kind of fake riding (?). Koremitsu grumbled quietly as he flailed about. Honoka continued to whip up splashes with her hands as she saw Koremitsu carry a pretty elementary school girl, swimming through. The promise to go to the pool was only between the two of them. Why was it, that when she talked about him, her face sizzles? Amongst other things, this was one thing she had been secretly wishing for. Koremitsu however would not contact her no matter what. ”Well, it’s to be expected, Akagi has never asked a girl out before, and he won’t spend much thought on it anyway. This is bad of you, Akagi. What would have happened to you without this love expert in me leading you?” Her face blushing, she dialed Koremitsu’s phone. And so, what was supposed to be a promise to go to the pool ended up with an elementary school kid popping in. She yelled for some reason. Upon recalling about it, she realized she had fallen completely into Shioriko’s trap. Back then, Shiiko was still distraught, going through the pain and loneliness of losing her kin, and it was to be expected that she wanted to play with her big brother. Besides, Honoka did think of wanting to build a good relationship with her as she was the little sister. But at the swimsuit counter at the department store, the naive thinking she had before this went up in smokes once she faced off against the real Shioriko. She had already heard that the girl was a real beauty, and even from the little photo with the black censor bar over the eyes, she could tell that Shioriko’s cuteness was outstanding. The wonderful, silky hair was devoid of any split ends, that innocent expression of hers, the milky white skin, the rosy cheeks, the alluring pink lips that were glossy even without lipstick. Though the girl was underaged, her limbs were slender, to the point of seductiveness. She was dressed in a long skirt covering her knees, and she lifted her head up. The angel-like, pixie-like pretty girl latched her slender arm onto Koremitsu’s, ostensibly declaring to others that Koremitsu was her belonging, giggling away at Honoka. At that instance, Honoka understood her intent. She was warding off Honoka, standing in front of her, letting Honoka know that the latter was the obstacle between her and her big brother Koremitsu. ”Stop kidding with me! Even if she’s a pretty girl who can be heads and tails above the rest in a contest, I can’t possibly lose to a kid with flat chest and hasn’t reached puberty yet!”—Upon thinking about this, she undid the pareo, and got into battle mode. She was really yearning for the pool date on this day, with the unyielding mentality. She requested Michiru to assist her and get Shioriko away from Koremitsu. Michiru widened her eyes under the glasses. She got an affirmative response. But there was the sudden doubt that he was a fanatic for school swimsuits. And in the end, because she got careless, Shioriko clung onto Koremitsu. Honoka was positioned such that she could not see Koremitsu’s expression from the front, but after seeing Shioriko gleefully playing on his back, Honoka could only think that Koremitsu was the same. If she did not hurry, she as the Purple Princess would fail to live up to the title of the love expert that gave lots of advice to girls skeptical over their love. Honoka was startled due to a voice that should not be present. A short-haired boyish girl was leering at her. Michiru held her glasses with both hands. Why would Hiina Oumi of the news club be here? She pondered as she stared at Hiina’s breasts. Leaving aside her appearance, the massive humps wrapped under the refreshing green bikini were round like melons. No, it would be more accurately to say that the bikini was about to burst out, or ripped apart at least.It felt like thin green clothes covering the most exposed areas. Whenever Hiina moved her body slightly, the two lustrous round melons would dangle left and right. And Honoka’s eyes followed them. After having her name called, she finally recovered. She lifted her head, and stared at Hiina. Hiina in return gave a boyish smile. She said that spiel of words in one go. If it was Shioriko, she could hug Koremitsu while maintaining an innocent look. If Honoka, as a high school student, was to do the same thing, Koremitsu definitely would be shocked, to say the least. But it was impossible. Definitely impossible for her. Hiina stood up, and sneaked upon Koremitsu. Honoka hurriedly pursued Hiina, and Michiru in turn followed them. Hiina grabbed Koremitsu’s legs from behind. As his legs were suddenly grabbed, Koremitsu fell into the water. Shioriko too lost her balance and tumbled to the left. This too messed up Koremitsu’s balance, and with weights on his back and waist, Koremitsu sank further. The flustered voice gradually distanced. Koremitsu floated to the surface, and coughed hard as he choked on some water. Hiina closed her eyes, raised her lips, and closed in on Koremitsu’s lips lecherously. And after saying that, he pushed Hiina away. Now that she had mentioned this, Koremitsu, who was usually shunned by others, felt a sense of guilt. Hiina spread her arms wide and hugged Koremitsu. Her large breasts were pressing onto his chest. Shioriko gasped upon seeing the abnormally large volume of the springy breasts. The bouncy feeling pressing on his abdomen was really a bad thing to him. “A pool isn’t a place for such public lewd acts!” Koremitsu yelled. If he were to push her off hard, her swimsuit might end up being ripped off. Thus, he did not dare to use all his might. And later, Honoka caught up to them. Such voices rang from the sidelines. Fulfilling her responsibility as the class representative, Michiru got in to help break them up. But as they continued to nudge about in a frenzy, someone’s elbow caused Michiru to be pushed aside, and she slid away, sinking into the water. The pool was not very deep as it was designed for kids, but as she lost control of her legs, she started to flail about. Honoka let go of Koremitsu. Koremitsu moved towards Michiru and leapt into the water. And both Shioriko and Hiina undid the drawstring on his pants, causing the pants to slip off. 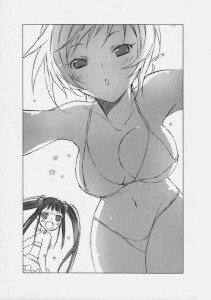 As Koremitsu brought Michiru out of the water, a pair of swimming pants floated slowly to the surface. Michiru, coughing out water as she gasped for breath downwards, ‘Wah!’ exclaimed in shock. The surrounding onlookers gave Koremitsu disapproving looks. Koremitsu grumbled furiously in his heart. Having vowed never to go shopping with girls again two days ago, Koremitsu made a vow ‘not to go swimming with girls again’ on this day. Koremitsu gritted his teeth, letting out a gnashing sound. Before this, girls always shunned Koremitsu. Thus, he had never experienced the hardships of having to deal with them. Ever since he got to know Hikaru, who really liked girls, and completed the latter’s promises that were made before his death, Koremitsu had been appearing in front of girls like normal. Such an improvement was certainly worthy of praise. But Koremitsu still did not know how to get along with girls. The clear expression gradually dulled. And Koremitsu’s voice was stuck in his throat. The rich, gentle voice throbbed Koremitsu’s heart. Unknowingly, he had gotten used to having Hikaru by his side. Though he would space out or think most of the time, the presence of the refreshing voice beside him allowed him to relax. But such a relationship could not continue forever. Perhaps they would have to separate the next time. Or even at this moment. If it was not as Hikaru as said, that he would not be able to depart until his promises with the girls were complete, what exactly would cause him to remain in this world? Koremitsu could not comprehend. How was he supposed to reject Hikaru when the latter put it this way. But Shiiko was always at Koremitsu’s home (base) after volume 3. Kinda. Will get that sorted when I get back from hunting Koremitsu down. the formatting is kinda off..
thanks for translating this novel anyway~!